Bexhill United manager Ryan Light said the football club ‘explored every avenue’ to contest tonight’s (Tuesday’s) match away to Alfold. The Pirates were unable to field a team for the Southern Combination League Division One Challenge Cup quarter-final due to injuries, illness and players not being able to get away from work in time for the 7.30pm kick-off. Light said: “We’ve explored every avenue. From a squad of 18, nine were unavailable through injury, illness and not being able to get out of work. “We thought we had got 11 and then unfortunately the two injuries we picked up on Saturday (to Liam Foster and Nathan Lopez) didn’t come through fitness tests this morning. 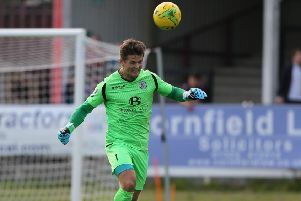 A fascinating contest was on the cards between the teams lying second and third in the league table, had Bexhill been able to make the 60-mile trip to the West Sussex/Surrey border. Alfold, incidentally, had to come to Bexhill for a league fixture on Tuesday January 8 when a 90th minute goal gave them a 1-0 victory. “Some of them (the players) had taken holiday days from work to leave early and with the form we’re in, given the chance we would play every night,” continued Light. “The players who finish work at 5.30pm would be able to get to Hailsham, Seaford no problem. There’s only a handful of those longer ones which would always be a struggle on a Tuesday night. Because we don’t pay players, they can’t afford to take too much time off work. “We’re obviously disappointed because we’re on a good run of form and want to play every game in every competition. “It wasn’t for the want of trying, everybody tried to be there, but through nobody’s fault, on this occasion it just hasn’t happened. It hasn’t happened to us before and we hope it doesn’t happen again. As it stands, Bexhill have four fixtureless Saturdays between now and the end of the season, the first of which is on February 16, when Alfold don’t have a game either. “It’s a difficult one,” added Light. “We’ve got so many free Saturdays and Alfold have as well, but no blame can be attached to anybody. Bexhill have a second team, which plays in East Sussex Football League Division One, but Light says the second team players aren’t registered for the first team and the two sides effectively operate as separate entities.